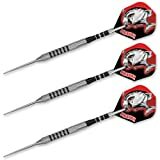 If you are having trouble deciding on a nice pair of tungsten darts, then look no further than the Dart World 19903 Piranha dart set. A world class set of tungsten darts at a nice & affordable price point. Everyone enjoys playing darts whether they are youngsters or adults. Some people like to play for fun while others are very competitive with this game. You can also find many people using this game for achieving stress relief. People use it as a self improvement tactic for improving their focus or to help with achieving their goals. But what plays the lead role in all of this is the dart. A good set of dart is the key for hitting your target consistently. The Dart World 19903 Piranha 90% Tungsten Dart (24-Gram) is an ideal choice for those who are serious about improving their skills. These days, Tungsten darts are extremely popular among dart players who are beginners looking to improve their dart skills. Professional league players are also using tungsten darts. The pro players understand the main benefits of utilizing tungsten in the manufacturing process of a dart. Tungsten is said to be a denser metal than brass and has many advantages over brass. Another crucial reason why this metal is being used for building darts is that it can be manufactured to precise and specifically different weights. This allows for easier handling among other beneficial qualities. Tungsten allows manufacturers to produce a much thinner barrel which helps increase the control and the accuracy of the dart. People who enjoy playing darts know very well that the build quality of a dart is one of the keys that can help improve your accuracy and proficiency in the sport. It is important for a player to match their desired playing style with a good set of darts. The Dart World 19903 Piranha Darts are something that you will become proud of owning due to the high quality construction of the dart itself. While shopping for a good dart set, you may find that most options may be a tad bit expensive. Nonetheless, there are a range of options at different price points that are suitable for dart players at all skill levels. This product consists of a 90% tungsten barrel. It has top spin revolving shaft and it comes with a galaxy metal carrying case. These darts are perfectly straight and balanced which is very important for a player that’s aiming for their targets. The spinning shaft flights are very crucial for an accurate flight. The 19903 Piranha Darts are considered as the benchmark that is used for measuring other tungsten darts. The reason is that Piranha is well known for its design, balance and supreme quality. It is also well know as one of the best performing darts in the market. You know your skill perfectly and also that your game is as good as your skills. The Dart World 19903 Piranha Dart will help you in improving your skills as they are a high quality piece. They have a great grip. They hold up perfectly and are sturdy while being drooped or wedged by other darts. If you are serious about improving your skills or about upping your dart game you must look for a good dart set. The Dart World 19903 Piranha 90% Tungsten Dart (24-Gram) can be a good choice. It has all the crucial features required for making it a wise choice. You can carry your darts anywhere with you as it comes with a great case that makes it easy to carry around with you.